I don’t know about you, ThinkCrafts readers, but I am totally on-board with the bunting/garland craze that’s happening in the DIY and decorating worlds right now. In the past few months I have made several garlands, and they just add such a lovely touch of whimsy to my space. This project idea came to me very suddenly and broke me out of a creative dry-spell I had been in. Sometimes you just need a quick and fun DIY that costs practically nothing, and this is exactly that. 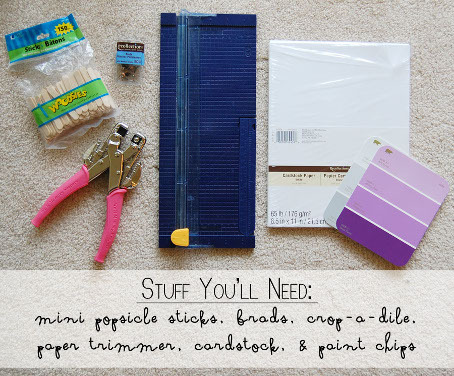 I had all the supplies on hand, and chances are you will have a lot of them to if you craft pretty regularly. Well, you may need to go grab some paint chips. I love crafting with paint chips. Gotta love free supplies! I used Behr paint chips that start out at 5×6″ from Home Depot. 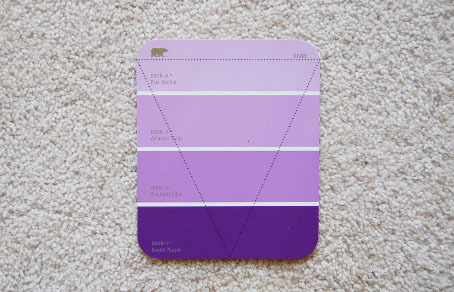 The measurements I’m using then, are based on paint chips that size. Measure 2.5″ from one side and mark the center point along the bottom edge of the paint chip. Using your paper trimmer, cut from each top corner to the center point you just marked to form the triangle. Your triangle should be 5″ wide and 5.5″ high. 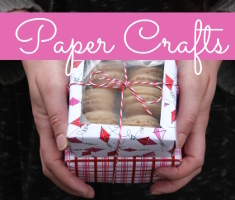 Now cut triangles from your cardstock. You want triangles that are 5.5″ wide and 6″ high. You can get three triangles out of an 8.5×11″ piece of cardstock. I have a template you can download here. 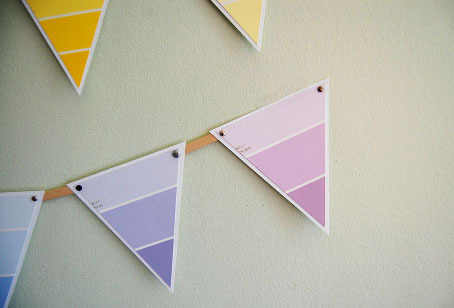 Using your tape runner, mount your paint chip triangles to your cardstock triangles. Use your crop-a-dile to punch small holes into the top corners of your triangles and the ends of your mini popsicle sticks. If you don’t have a crop-a-dile, you can just punch holes in the triangles with a regular hole punch and drill holes in the popsicle sticks. But let me just say, my crop-a-dile is probably in my top three craft tools and I highly recommend owning one. 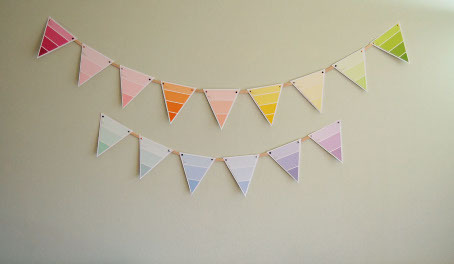 Attach your triangles to your popsicle sticks with your brads, and tape up your new bunting! 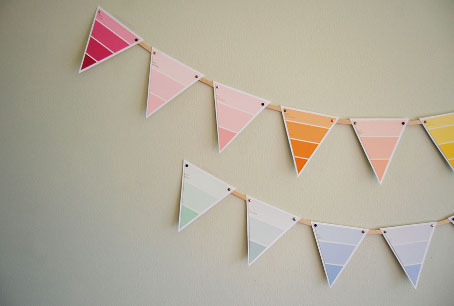 This would be really cute for parties… How easy would it be to customize your colors?! And adding lettering would be adorable too. Happy crafting! This entry was posted in Bunting & Garlands, Crafts, Holidays & Seasons, Home Decor, Paper Crafts, Parties, Recycled Crafts, Wall Art and tagged Green Crafting, Recycled Crafts on April 23, 2013 by Monica. The supplies may seem free, but if I were a paint store, I would not appreciate folks coming in to grab several handfuls of paint chips that SOMEONE pays for….now if you have a bunch of random ones lying around from past projects or have lots of construction paper you want to cut up, that seems like a worthy project….this is like taking all the plastic forks from McDonalds to make your home craft projects….. 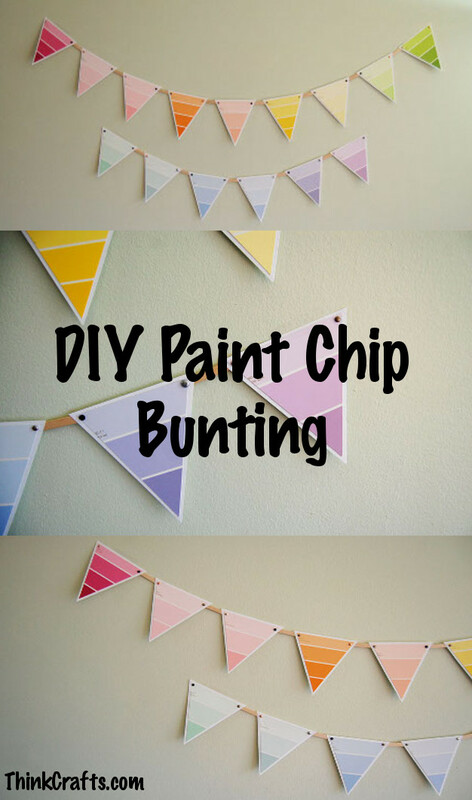 Cute idea, but this stuff is meant for purchasers of the products…who knows, they just may be out of your favorite color chip when it’s time to go pick out paint for YOUR home…. You could have a paint store SAVE their outdated samples for you maybe, but then there are storage issues and there is not the spontaneity of the moment to deal with…. Those paint chips are not valuable pieces of inventory that the retail establishment or the paint manufacturers are losing any money on. They are essentially brochures. What are brochures? The same junk we get pounds of in the mail every year, the same catalogs companies send out, and the coupons we get at the counter at drug stores. 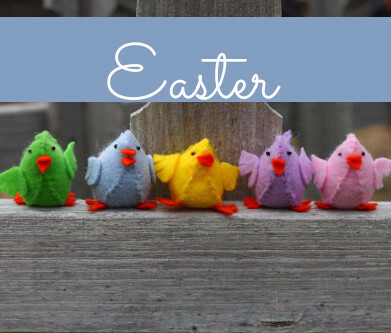 If anything using a few.of them to do cute things to decorate your home is keeping them out of landfills. How many people do you know or observe in say Lowe’s, that pick up 10 to take home to show their spouse or whatever, and they just end up in the trash. 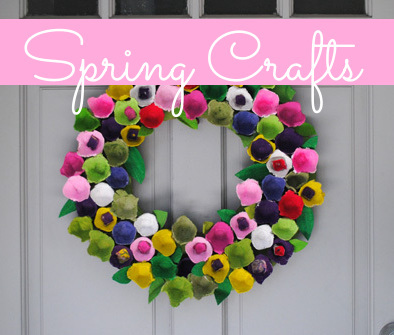 Why not grab a few and do something nifty with them? Because they are, in fact, brochures for paint, catalogs for paint, advertisements for paint. No one is being put out of a job or losing a ton of money on them. If that was the case, they would be considered inventory and have a price tag. eat idea! You go girl!